Colorado Supreme Turf Lawn Mix is a mix of selected high-quality, fine-textured Kentucky Bluegrass species that form a dense, uniform sod with outstanding deep color, excellent wear-ability, heat and drought tolerance, winter hardiness and disease resistance. Colorado Supreme Turf Lawn Mix is a mix of selected high-quality, fine-textured Kentucky Bluegrass species that form a dense, uniform sod with outstanding deep color, excellent wear-ability, heat and drought tolerance, winter hardiness and disease resistance. Colorado Supreme Turf Lawn Mix incorporates the features of the Bluegrass for Colorado and adds Tall Fescue for more shade tolerance with Perennial Ryegrass to enhance quick establishment. Great to use for sports turf, play areas and areas with dog traffic. Strong rhizomes enable this turf to fill in bare areas quickly and recover from damage easily. Seeding Rate: 4-6 lbs /1000 sq ft. This is a mix with a multi-year shelf life when stored in a Cool and Dry environment. Additional seed purchased this year can be used for years to come when stored properly. SEEDING RATE: For new lawns, use 4-6 pounds per 1,000 square feet. Rake into the top 1/4 inch of soil, water daily or as needed to keep the soil surface moist until the seedlings reach 2 inches tall. Timing: Seed in the Spring or Fall when the soil temperature is 60 to 70 degrees for best results. Maintenance: Mow to encourage grasses to spread. Do not mow to less than 3 inches in height. Over-seed bare spots to minimize weed growth. 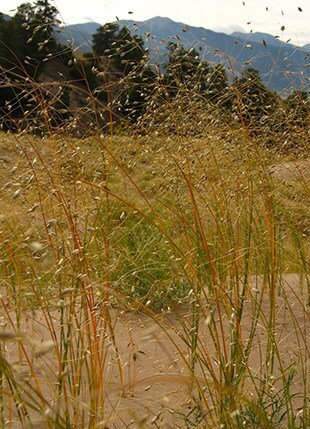 Spring or Fall are excellent times for over-seeding. Flax, Blue – Linum perenne appar.